The gist: Creative inspiration is all around us, but we don’t see it because we’ve been conditioned to look for it in only a few places. When you reset your expectations about creativity, you’ll become more creative. I once joined a business started by some friends. My job was to figure out how to make our members happier and retain them longer. Hi, I’m checking my credit card statement and it looks like I’m being billed twice every month. I hadn’t seen that happen before, but she was right. We were billing her twice a month. For a really long time. I had no idea what to do. Looking back, there were lots of ways to solve the problem but, in the moment, I was tired and feeling uncreative. I couldn’t see an easy answer to the problem. So, I did what I do every time I’m burned out in the middle of the day. I went to tea shop and ordered some kombucha. The barista pulled the tap and, halfway though, it fizzled out. Kombucha’s gone! I already paid, and the manager—the person who can process refunds—is out for the afternoon. So, she thinks for a moment and comes up with the perfect solution by offering to make something else in exchange for a gift certificate for a kombucha the next time I come in. I happily took the offer and was on my way. Hey! You’re right. I’m so sorry about that. What if I take what you’ve paid so far and credit your account so you don’t have to pay again for a long time? Nora was happy with that, and the problem was solved. No one wrote a song, drafted a book, painted a mural, or designed a product. But they were creative. They were unique solutions to a problem. Creativity is all around us but, for so many, it remains invisible—hidden in plain sight—because we’ve conditioned ourselves to look for it in only a few places. There are so many places you can draw new ideas from to improve your work if you look just a little harder. When you have a problem to solve or need to create something new and keep coming up short, try these practical ideas for finding inspiration and upping your game. I’ve learned many things starting and running different business, learning to write, and building better relationships. One lesson that stands out is that problems you can’t solve now also probably can’t be solved in the next five minutes. When you know there’s a problem, your brain doesn’t want to leave it alone. It’s like a scab you can’t help but pick at. Most problems won’t solve themselves, but they often do need some space. Fixating on them narrows your ability to think about other things. But it’s exactly those “other things”—particularly the connections between them and the thing you’re working on—are where creativity comes from. 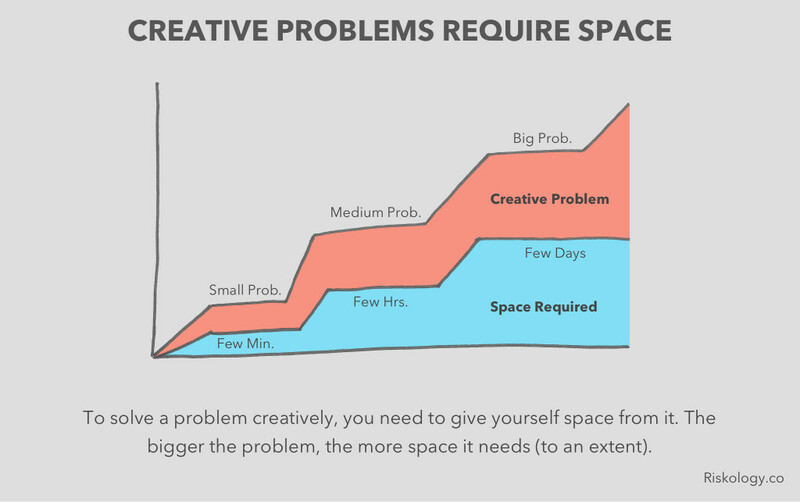 To creatively solve problems, you have to actually make space (and time) for creativity. It’s difficult with the intensely busy lives we lead, but necessary nonetheless. And the bigger the problem, the more space it needs. One reason I made the connection between the kombucha problem and the customer service problem is because I took 20 minutes to relax and walk to the café. That let my brain start to wander to other ideas. Had I run into the problem while I was at the café, I probably wouldn’t have been as open to seeing the opportunity. Small problems may only need a few minutes to find the creativity needed to solve them. Medium-sized problems may need a few hours of separation. Big ones may need a few days. Creativity can be hard to find because we’ve grown up being taught to look for it in specific places. We go to art galleries to see the creativity of painters. We turn on the stereo to get lost in the creativity of music or read books to imagine the stories within. Basically, we look for creativity in art, but our general definition of what constitutes art can be incredibly limited. Thinking you can only find creativity in traditional art is like thinking you can only find money by withdrawing it from the bank. Rich people know money is everywhere. Creative people know creativity is everywhere. Sometimes, we procrastinate for good reason. Sometimes, we don’t. Whatever the reason and whatever the result, we know this: however much time you give yourself to complete a creative task is how long it will take. That’s called Parkinson’s Law, and it’s been true since long before it had a name. If you’ve ever struggled with a creative project, you can probably relate. There’s something about the pressure of a deadline that jolts your brain out of La La Land and turns it into a drill sergeant. It isn’t the most pleasant experience, but no one said creativity was easy. So, how do you do deadlines right? When it comes to creative work—especially work you’re doing for yourself—it’s easy to set deadlines you blow right through because you know they aren’t real. Ask yourself, “What can I do to make this deadline feel real?” When you answer that question successfully, the creative inspiration flows because it knows it can’t wait any longer. Likewise, limiting the amount of things you’re allowed to use to solve a problem will force you to come up with simple, creative answers. Use one color to create your drawing. Write your article in less than 500 words 2. Build things with the tools you already have and nothing else. The ground control crew who saved the astronauts on the Apollo 13 mission invented their life-saving contraptions from seemingly thin air. They had to because the only materials they could use were what was already on the space capsule. They had to be simple because they could only give the flight crew instructions for how to build it via radio transmission. And they did it in less than 24 hours because that’s how long they had before the astronauts would run out of oxygen and die. Hopefully, your creative endeavors won’t come with such dire stakes, but the more real and terrible failure seems, the more creative you’ll become. Take a break. Give your brain some space to think of other things. Expand your definition of creativity. You’re probably conditioned to look for it in specific places. Break that mold. Limit yourself. Fewer tools and less time, counterintuitively, force you to be more creative. Think about a creative project you’re struggling with. Give yourself permission to take a break from it for a while, go look for examples of people creatively solving problems you don’t normally think about, and then come back to work on it with strict limits on the time and resources you’re allowed to use. You might find you’re more creative than you think. Certainly not my scenario; I just copied the barista.